Home » Fun » Books » What’s the Best Grilling Book for Me to Learn New Skills in 2018-2019? What’s the Best Grilling Book for Me to Learn New Skills in 2018-2019? Grilling books are great for both new grill masters and experienced ones alike. After all, how will you learn more skills if you don’t have a few grilling books on hand? However, there’s no one special book that can teach you all you want or need to know. The truth is that the book you need completely depends upon your experience, what skills you have and what skills you lack. Learning is always a big part of a hobby if you’re serious about it, and there’s really nothing more exciting than learning how to perfect the art of cooking food. Outdoor food can sometimes seem impossibly complicated if you don’t know what you’re doing. Even simply grilling up a few legs of lamb sounds easy enough, but if you don’t have the right equipment to get the lamb to cook at the right temperature, you can end up with the meat too raw. On the flip side of that, if you scorch a leg of lamb, you’re just ruined some perfectly good meat. So are you looking for the best grilling cookbooks 2018-2019 has to offer? Here are some of the favorites, many which have been recommended by people in the food trade themselves. Buy one or two of these and you’ll probably never need another grilling cookbook. This is the cookbook that’s up to date in 2018 not only for equipment such as thermometers and burger flippers, but also on the different outdoor cooking stoves (i.e. grills.) Meathead has got all of his grilling recipes down to a science, and he wants to teach you how to do that, too. He’s also a big advocate of barebones cooking, understanding that yes, you need the basic tools, but you may not need much beyond that. He prefers to cook over a low-tech, open fire Weber grill for most of his recipes, and will repeatedly let you know that’s really all you need, too. If you’re new to grilling, you will love the common-sense knowledge as well as the years of testing equipment that can give you the information you need. Many, many years of experience speak their secrets to you in this grill recipe book – and the good new is, it’s not “luck” or “talent” that makes a good barbeque dish – it’s science, and you can learn it. A James Beard Award finalist, this book is serious business, even though it is meant for newbies or less experienced grillers. It will take you through the basics of grilling step by step, whether you’re using a traditional charcoal grill or a gas grill that lets you set the temperatures. Because of the variety of recipes, you’ll learn how to master some subtle yet flavorful recipes in no time. Gone are the days of just hot dogs simmering on the grill – you’ll be capable of so much more. The recipes in this grill book are simple yet flavorful, and they definitely give the less experienced griller some room for imagination. There are recipes that will teach you to grill nearly any food imaginable, and, of course, instructions on creating and using flavorful homemade rubs, the staple of any good grill master. Weber has been a favorite grill maker in the US since the 1950’s, and because of them, the barbeque is a convenient and portable event for families, football fans, and groups of friends all over the world. If you own a charcoal grill, this book is the first step to making perfect grilled meals. Grilling is often chosen as the preferred method of cooking because it can be accomplished quickly and safely. But once you’ve mastered grilling basics, it’s time to take your grilled meals another step farther. This grill recipe book offers beautiful, full-color photos and 365 recipes; from beef to seafood and of course a dessert chapter with 11 variations of S’mores for you to choose from. Grill wisely! This is a great grilling cookbook for men who have purchased their first Weber grill and need some inspiration. If you’ve never touched an open flame stove or grill before, then you’re probably wondering if there’s a how to grill book just for you. Yes, of course there is! Grilling for Dummies can take you from buying a grill to planning your first outdoor party, without a lot of fuss. Grilling isn’t a chore it’s a celebration. But if you’ve every planned a celebration, you know there’s still a lot of work involved. Don’t be embarrassed with buying the Dummies brands – they will save you a lot of time if you get information overload when searching for grill advice on the Internet. The book itself, despite its testosterone-driven title, explains how to go a step farther than most of the books. You don’t start out in this book learning the names for different tools – you start out by learning how to grind yourself a perfect hamburger or season yourself a steak. Once you’ve achieved these basics –which are all some men will ever need– you’ll also learn how to patiently wait for the world’s best BBQ to come out of your charcoal pit. The recipes in this book are meant for the BBQ obsessed, and the enthusiasm in the words shows that this is who you, too, can be. Learn the basics, become a modern butcher and chef, and your friends will never want to leave the man cave or your living room. 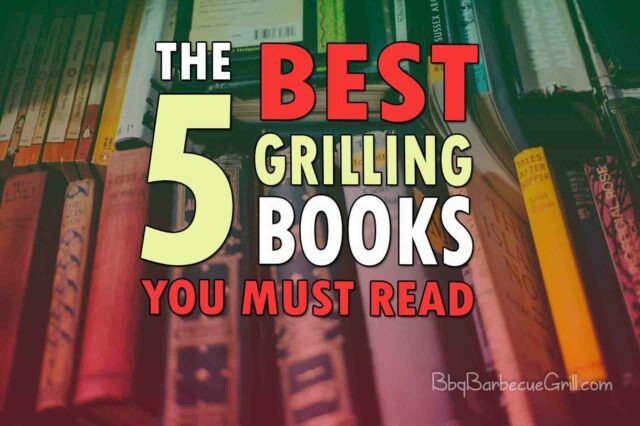 These are just five books out there, but there are literally hundreds of books on grilling, which is kind of amazing considering it really wasn’t popular until about 1952, when a man working at a company called Weber invented it. Learn the basics about tools, herbs and spices, and temperatures. Once you’ve mastered those, you’ll find there are even more exciting ones with recipes to last you several summers. Experiment with food you normal pop in the stove, such as turkey breasts or a brussel sprouts. You’ll find there are many ways to enjoy food off the grill, and everyone you cook for will be happy to help you enjoy it. And what will be the best grilling books in 2020? If you are interested in this subject subscribe us and share your opinion in a comment. Thank you!